Remember when you were a kid, and you thought the Ewoks in Return of the Jedi were adorable? And remember when you grew up a bit, and you suddenly hated the Ewoks because you couldn't understand why on earth there were glorified teddy bears in a film that featured the greatest villain in the history of modern cinema? And do you also remember when you grew even older, and it slowly dawned on you that the Ewoks were actually eating the Stormtroopers they captured, and then you didn't know what to think anymore? Well you're in luck, because now there's a statue that captures all of those conflicting emotions in one terrifying image. 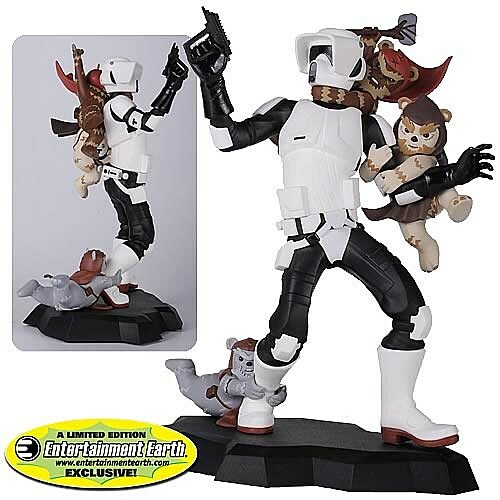 Gentle Giant has provided Entertainment Earth with an exclusive Star Wars Scout Trooper Ewok Attack Maquette, available for pre-order now and to arrive in April 2013, for $89.99. Because you're an adult now, and part of being an adult means having the option to spend your hard-earned money on statues of anthropomorphic teddy bears that eat human flesh. Check out the full, profoundly upsetting image after the cut. For full details, visit Entertainment Earth's website.